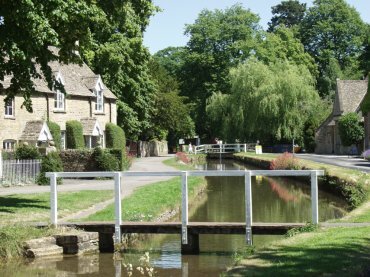 BeenThere-DoneThat: Upper and Lower Slaughter, Cotswolds, Gloucestershire. 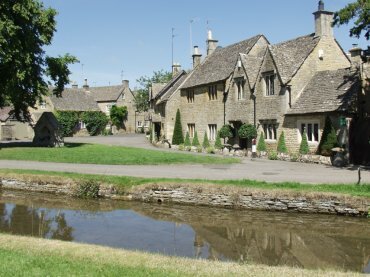 This picturesque cotswolds village, with it's cottages made of yellow stone, is made even more picturesque by the River Eye, also known as Slaughter Brook, flowing through it. Unlike Bourton-on-the-Water, nearby, visitors appear relatively unobtrusive. This part of the village with it's little green by the river is really very pleasant. The word 'slaughter' is derived from the Anglo Saxon meaning a muddy place. Not quite how it appears today. The Old Mill, Lower Slaughter. 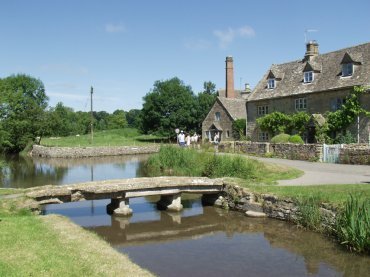 The Old Mill is to be found, just round the corner of the cottage with the dormer windows, where the River Eye meets the north-western edge of the village. It is open to the public as a museum and shop. The red brick chimney is part of the mill and the mill has the only brickwork to be seen in Lower Slaughter. There are a number of small footbridges along the river as it runs through the village. There are also a number of very small stone steps by the river's edge as can be seen at the left end of the bridge. I surmise, lacking any real evidence, that they were to enable villagers to easily get water from the river. Somewhere down in among the trees is the Washbourne Court Hotel where we stopped for lunch. 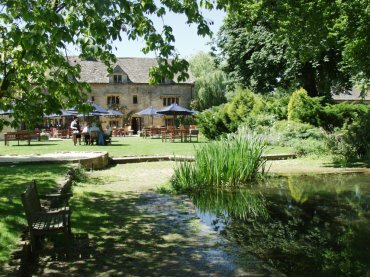 Washbourne Court Hotel, Lower Slaughter. Having walked from Stow-on-the-Wold to Lower Slaughter, then on to Upper Slaughter and back to Lower Slaughter we decided that we deserved a really good lunch - and this is where we found it. We sat in the garden of this 17th century hotel and thoroughly enjoyed an excellent meal in delightful surroundings. What a lovely way to end a morning and fortify ourselves for the afternoon. Washbourne Court is to be strongly recommended. 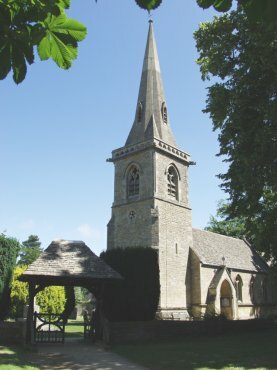 St. Mary's Church, Lower Slaughter. This is a pretty church with an impressive spire but not really very old having been re-built in 1867. There remain, however, some 13th century arches between the nave and south aisle. We arrived in the village on the footpath from Stow-on-the-Wold and found that this church was about a hundred yards down the road.